Noah is really, really funny! 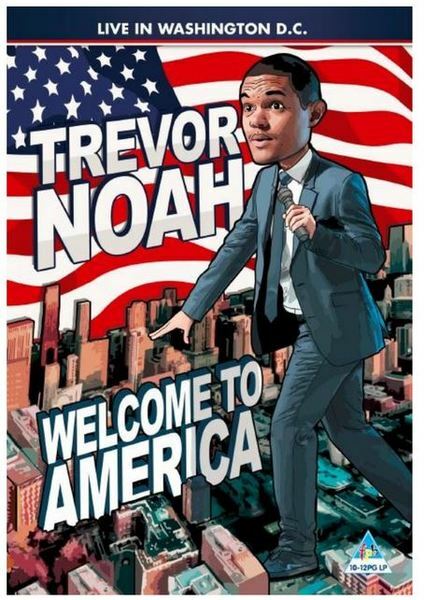 After watching Welcome to America , it is understandable why Trevor Noah is South Africa’s favourite stand-up comedian, and has now found fame in America as the host of The Daily Show, with his razor-sharp with and heightened sense of ‘Racism Spotting’! Noah’s success can be contributed to the fact that he does not try to be funny, and never uses profanity to raise laughter. He has the natural ability to be funny, using oodles of charm, refined wit, and intelligent reasoning to turn the absurd reality of humanity inside out, leaving plenty food for thought as he provokes and challenges conventions. Filmed as part of the Lost in Translation tour at The Lincoln Centre in Washington D.C in 2015, Noah is truly ”a thinking fan’s comic, on a global scale” ! Some of the hilarious highlights include Noah’s observations about the police force, how he became a token during the Ebola scare on a flight from South Africa to the States, a laugh-out-loud journey into Kentucky, and his observations about the American culture. Make sure to add Welcome To America to your collection, it’s definitely well worth it, and a DVD you are bound to share with friends.